, a celebrated ancient astronomer, was born at Nice in Bithynia, and flourished between the 154th and 163d olympiads; or between 160 and 125 B. C. as we learn from tjie astronomical observations he tnade in that space of time. He is supposed to have been the first who, from vague and scattered observations, reduced astronomy to a science, and prosecuted the study of it systematically. Pliny, who always mentions him in terms of high commendation, says he was the lirst who attempted to take the number of the fixed stars, and his catalogue is preserved in Ptolemy’s “Almagest,” where they are all noted according to their longitudes and apparent magnitudes. 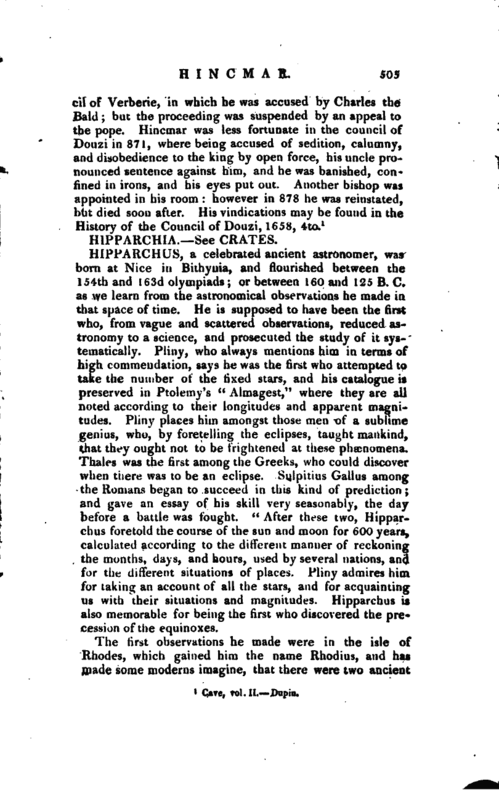 Pliny places him amongst those men of a sublime genius, who, by foretelling the eclipses, taught mankind, that they ought not to be frightened at these phenomena. Thales was the first among the Greeks, uho could discover when there was to be an eclipse. Sulpitms Gailns among the Romans begun to succeed in this kind of prediction; and gave an essay of his skill very seasonably, the day before a battle was fought. "After these two, Hipparchus foretold the course of the sun and moon for 600 years calculated according to the different manner of reckoning the months, days, and hours, used by several nations, and for the different situations of places. Pliny admires him for taking an account of all the stars, and for acquainting us with their situations am! magnitudes. 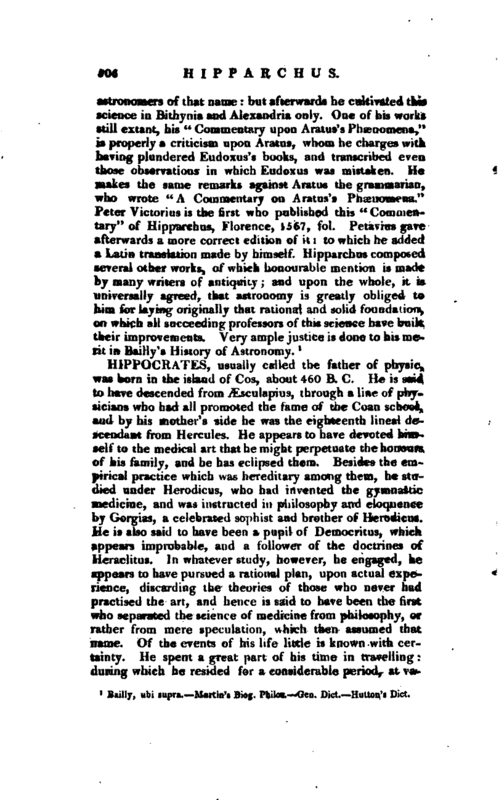 Hipparchus is also memorable for being the first who discovered the precession of the equinoxes. Bailly, ubi supra. Martin’s Biog. Philes. Gen. Dict. —Hutton’s Dict.